Sustainability is a complex topic that means different things to different people and companies. Alison Taylor, vice president of sustainability for Siemens, shared her insights about the evolution of sustainability, especially as it applies to Siemens, with attendees of the Dean’s Speaker Series on March 2nd. She tracked the evolution at Siemens in conjunction with its natural business cycles and industry challenges. She noted shifting definitions of sustainability, increasing sophistication in measurement and reporting practices, as well as increasing levels of integration into business strategy and practices, as indicated by five Stages of Sustainability. Overall, corporate America continues to increase its commitment to sustainability, with varying levels of engagement, often a result of drivers like anticipated regulation and shareholder demand influencing company actions. 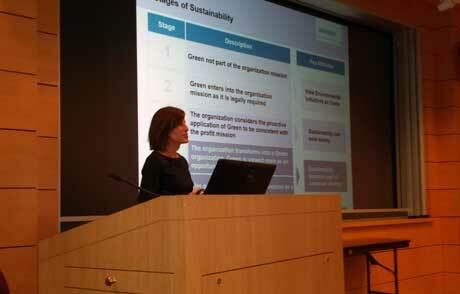 Changing trends also include an increasing level of consumer and C-suite awareness of sustainability-related topics. Sustainability has evolved over time from a basic understanding of “green, environmental initiatives” or the “Triple Bottom Line.” Corporate sustainability has now grown to encompass not only the goals of the entire enterprise, but its impact on future generations. Siemens is a global powerhouse focusing on the areas of electrification, automation and digitalization. One of the world’s largest producers of energy-efficient, resource-saving technologies, Siemens is a leading supplier of systems for power generation and transmission as well as medical diagnosis. In infrastructure and industry solutions the company plays a pioneering role. In fiscal year 2015, with nearly 348,000 employees in more than 200 countries, Siemens generated revenues of €75.6 billion. Siemens Corporation, ranked as one of the most sustainable companies in its industry according to the Dow Jones Sustainability Index, has consistently been recognized for customer and environmental management, as well as corporate citizenship. For nearly a decade, Siemens has also conducted research into the sustainability commitments and trends of corporate America. Its most recent findings reveal a maturing of the field and an evolution in the bottom line benefits of sustainability. Appointed by the Siemens Cities Center of Competence (C0C) as Vice President, Sustainability and City Executive for the District of Columbia in March, 2014, Alison is responsible for leading Sustainability initiatives in the US as well as the Siemens strategy for expanded presence in the Washington metropolitan area. Prior to joining the CoC, Alison served as Vice President, Sustainability-Americas. In this position, she developed and managed the sustainability program for the Americas and acted as a resource for sustainability initiatives across Siemens’ business sectors. Before joining Siemens, Alison was Chief Counsel to the U.S. Senate Committee on Environment and Public Works for five years, and counsel to the U.S. House Committee on Energy and Commerce for six years. Prior to her service on Capitol Hill, Alison was an equity partner in the Denver-based law firm Davis, Graham and Stubbs, LLC where she specialized in water law, mining law and environmental law. Alison graduated from Duke University with an undergraduate degree in biology, and the University of Denver with a juris doctorate degree. The Dean's Speaker Series, hosted by Dr. Ali Eskandarian, brings leaders and experts together with students, faculty, alumni and the community to facilitate discussions on the challenges and opportunities of our global society.